I have always loved staying in hotels. It is nice to step away from reality into a world of fluffy gowns and crisp bedsheets. If you are looking for a luxurious evening to escape the outside world, the Montcalm Royal London House truly is a must stay. We arrived on Saturday at 5 pm to a manager’s welcome. Our bags were taken up to our room as we were escorted by Dado, the guest experience manager (think Wonder Woman of the Montcalm – Dado went out of her way to make our stay a very special one). At the last minute, we were upgraded to a family suite where we were greeted by a chilled bottle of champagne and a welcome card. See the video walk-through on Salon Prive’s Instagram. The view from the room over Finsbury square was just beautiful. The rooms are complete with smart technology, which includes smart TVs with Sky as well as touch-pad lighting, underfloor heating and airconditioning. The beautifully appointed bathrooms boast with Hermes toiletries and wonderful lighting, which of course is a girl’s best friend when getting ready! Basically, everything you could ever want from a 5-star hotel room. When staying in the suites, you can attend the club lounge for breakfast and canapés/drinks from 5.30 – 9.30. Unfortunately, we missed canapés as these are only served until 8 pm. That being said, the wonderful Dado arranged some small bites for us (talk about going the extra mile). All the staff are so friendly and helpful – nothing is too big a task. In the evening we were excited to try the Aviary, the hotel’s rooftop restaurant and bar. I had seen such wonderful reviews and I can honestly say that I was not let down. The decor is dotted with peacocks and the decor is drenched in golden tones. Here you are able to eat either inside or step out on the roof for drinks. The view is simply amazing! Especially from an igloo, which can be booked for the evening. As a tip, I would get in early as they were jam-packed by the time we got there. The Igloos are incredibly cosy and are decked out with mini heaters, fur blankets and of course that incredible city view. These truly are perfect for evenings out in the winter with friends. Following their very busy evening, we managed to sneak in for a quick drink the next morning. By the time we were back in the room, our beds had been turned down without even having to issue a request. The room smelt beautiful, new fluffy robes/slippers were laid out and the underfloor heating was switched on. Access to Sky movies and a well-stocked mini bar filled with lots of yummy treats made the perfect end to a wonderful evening. For breakfast we decided to go back to the Aviary where guests can choose from either a buffet or set menu until 11 am. Looking at both menus, I have to admit that I prefer the buffet as it offers everything you could want and more. This ranges from a traditional English breakfast to smoked salmon and cheeses (my favourite). Before leaving we decided to make use of the wonderfully tranquil Montcalm Spa. The spa has a gym, sauna, steam room, a wonderfully hot jacuzzi (which we loved) and a very instagramable eight-metre swimming pool. There are three treatment rooms where you can leave behind your daily routine and just be pampered. The Montcalm Spa is well known for their extensive menu of marine-based body, face and massage treatments. I can honestly say that I am itching to go back to the Montcalm Royal London House, especially after a Monday back in the office. Rated as one of the top hotels near Finsburg Square, this hotel is great for families, business trips or especially couples looking for a romantic evening away. Thank you to the team who went out of their way to make our stay what it was. I would seriously urge anyone to treat themselves to a stay at this gem. For more information about the Montcalm Royal London House or to make a booking click here. Contributing columnist Mia L Middleton brings an insight to an influencer’s life in London. 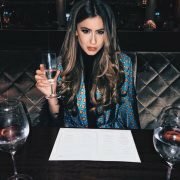 Her lifestyle column gives you access to everything exclusive in and around London. See inside the private parties you’ve always wanted to attend, the luxury hotels, spas and member’s clubs where London’s exclusive are pampered as well as the best hot-spot restaurants and bars. Be sure to follow her on Instagram as well for live updates!